Last week I started a series to provide some cooking tips to help readers actually enjoy their Thanksgiving. Remember, we’re aiming for turkey napkins here, not tablescapes. My husband accused me of making up that word. I only wish it were made up. This week we’ll continue to look at the Thanksgiving staples in a way that will look and taste good but not aim for Martha Stewart insanity. If you missed the post on pies, it’s here. The first way to make your life easier is to start handing out assignments. This is not being lazy or a bad host. In fact, it took me a long time to realize that guests feel better if they are allowed to contribute something. Some guests are stubborn and will inform you they are bringing that one thing they always make that doesn’t go with anything on your menu. Fine, let them make it—fighting and confrontation is not going to make Thanksgiving less work for you. If you have a set list of things you want, it’s also not unreasonable to give some guidelines. 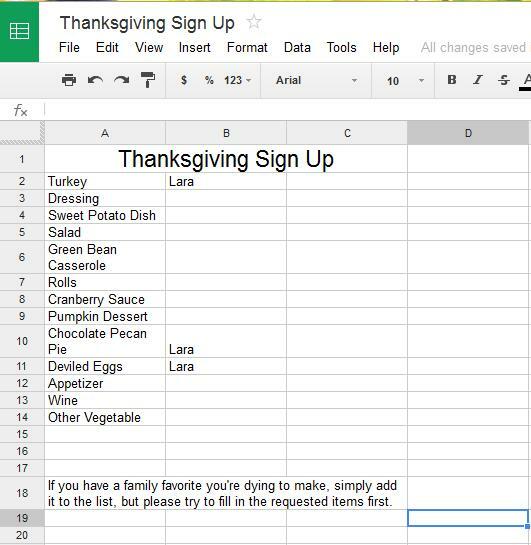 My Thanksgiving guests are just nerdy enough that I do a Google Doc online sign up with slots for the basics: sweet potato dish, pumpkin pie, rolls, etc. so I make sure all my staples are covered and I don’t end up with 5 pans of brownies. If you’re worried about non-cooks, offer sign up options like a bottle of wine or a cash contribution towards the turkey. You know your guests, so you know what they’d appreciate or find offensive. Sharing the load not only makes things easier for you, but it also gives individual cooks their opportunity to bring their killer mashed potatoes and feel helpful. If you don’t like Google Docs, there’s also meal organizing sites like Perfect Potluck. These are my personal favorites. 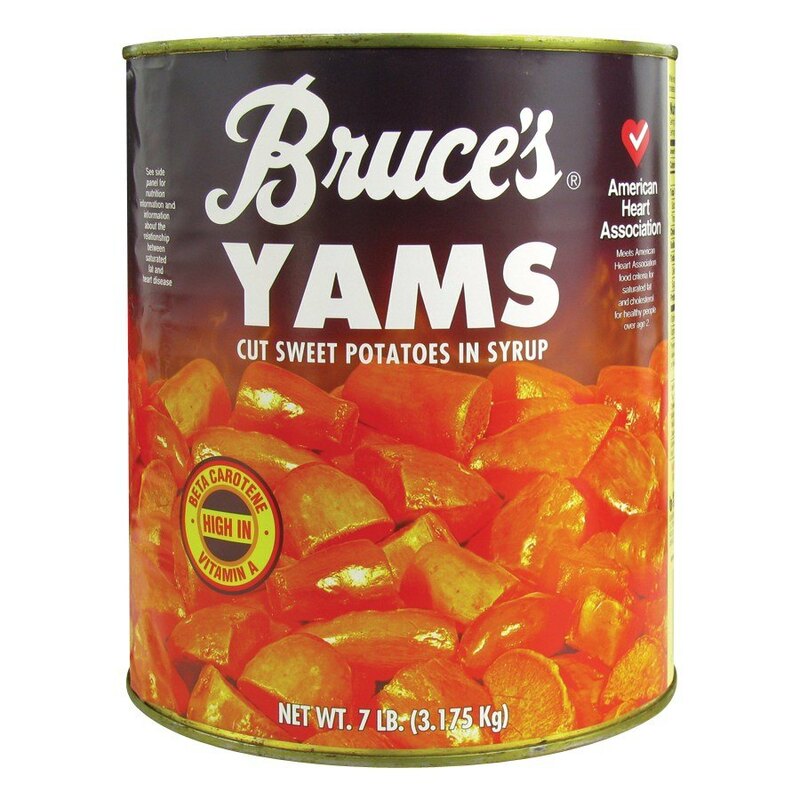 My grandmother used to buy the yams, peel them, roast them, let them soak in some magical syrup for at least a day, etc. I still am not sure what all she did to them, but while they tasted amazing, the process was intense. Yeah, don’t do that. Much like the pumpkin, canned sweet potatoes are your friends. If you eat yours straight up, like my Grandma did, then it’s worth it to cook the sweet potatoes yourself. I’ve never been to any other Thanksgiving were the sweet potatoes weren’t made into a casserole or smothered in marshmallows. If you’re going that route, just buy the canned. 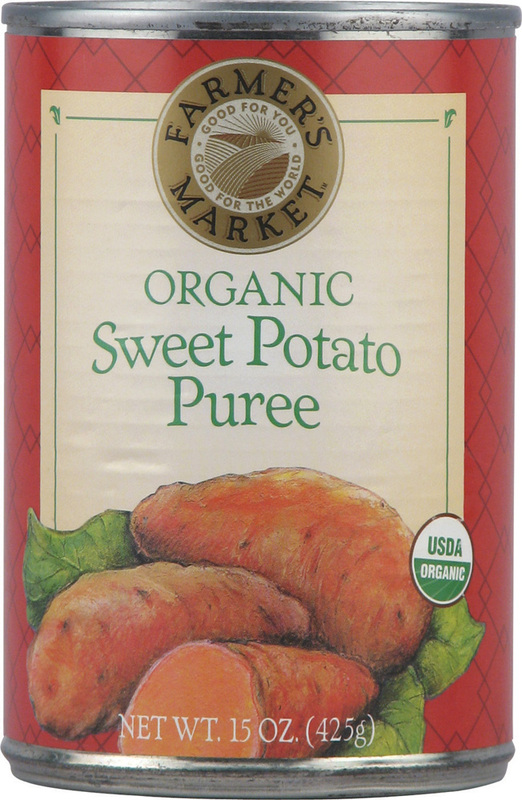 I generally go for the cut up kind in syrup that Bruce’s and Pricilla’s sells, but for a bit more money, you can buy straight organic sweet potato puree. 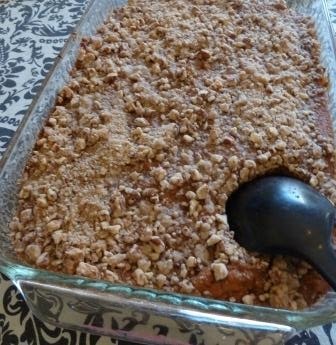 Once you have the canned sweet potatoes, this Streuseled Sweet Potato recipe is quick to prepare and has been a Thanksgiving stand by for me for years. I make it year round because we like it so much. Despite being a Cooking Light recipe, guests always accuse me of feeding them candy. I’ve had more than one person ask me if it was the dessert. I have always been a firm believer that if you have sweet potatoes then mashed potatoes are redundant, so I never serve them. However, I seem to be in the minority here, so I’ll concede to popular opinion. 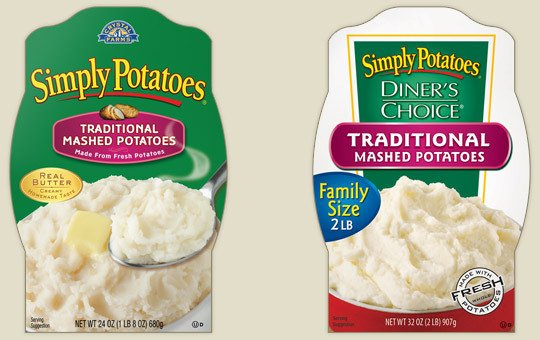 If you insist on both, or if you family just prefers mashed to sweet, there are a few ways to make it easier. First, don’t do instant potatoes. Draw that line in the sand now. Like the frozen pie, it’s the choice of a fatigued mind and your guests know the difference. If you don’t want to make them, there are many a fine refrigerated and frozen mashed potato product available. Just read your labels and make sure they’re using real potatoes. I’d also advise buying the one you’re considering serving and doing a trial run a couple weeks before as a side with your weekday dinner. Rumor has it the Simply Potatoes brand is good. If you decide to make your own potatoes, there are a few corners you can cut. First, buy red skinned potatoes and don’t peel them. Your mashed potatoes will be a bit more rustic, but a lot less work. Secondly, don’t make your own gravy. Making your own gravy is the worst. It can be done well and successfully, but it is also the last thing to come together and it’s a tricky technique. Making perfect, rich, lump free gravy is hard to achieve when Uncle Lester is hovering in the kitchen. 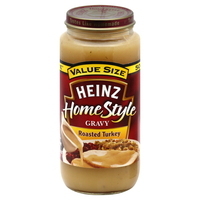 Heinz jarred turkey gravy is tasty and error proof. Even if you do all that, I always have the trouble of keeping mashed potatoes hot. They come together at the last minute, and the heat of the potatoes is what melts your butter, etc. They cool awfully fast, and I don’t have that perfect Crockpot size that all my elderly Midwestern relatives seem to have for the express purpose of keeping mashed potatoes hot at family gatherings. 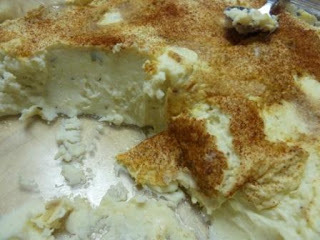 My solution has been to make this Creamy Mashed Potatoes recipe of my Grandmother’s. The potatoes are great by themselves, but I don’t fuss at my guests if they put gravy on them. 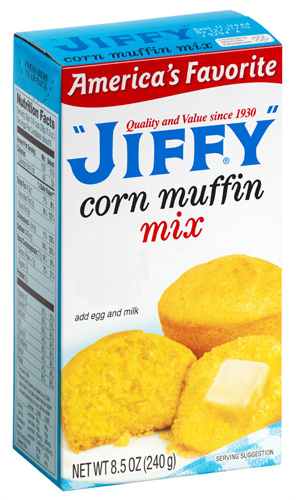 The added half and half and cream cheese also helps them stay moist over longer periods. She shared it with me, touting its wonders because you can make it a day ahead of time and then just stick it in the oven. That is indeed wondrous for a mashed potato recipe. It also has the benefit of coming out of the oven nuclear hot. I never worry about it going cold before guests can eat it. If you like it, just make the classic. I’ve tried fancy versions, but they taste wrong. The basic recipe is very straightforward; I don’t really know how you could make it simpler. 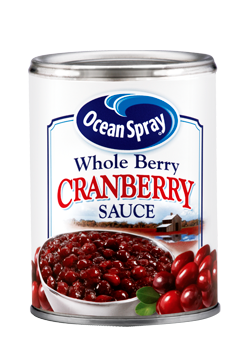 This is another instance where I’ve made many a fresh cranberry relish that never gets touched. You know what does get eaten? That crazy jellied stuff from the can. You know why? It’s basically sugar. I’m a foodie, and I like the canned stuff, too. I think people also like a known commodity. They know what the canned stuff tastes like, but there’s no telling what’s lurking in your fancy homemade relish. At this point we start to get into personal taste. I see a lot of proposed menus with brussel sprouts on them, yet I know very few people who like brussel sprouts. 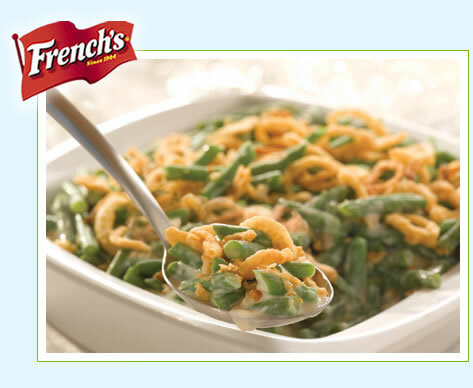 I’ve only been to one Thanksgiving with the reviled vegetable, and I’m pretty sure I was the only one that ate them. Corn in some form is another I’ve seen quite a bit. I’d go one of two ways with that. 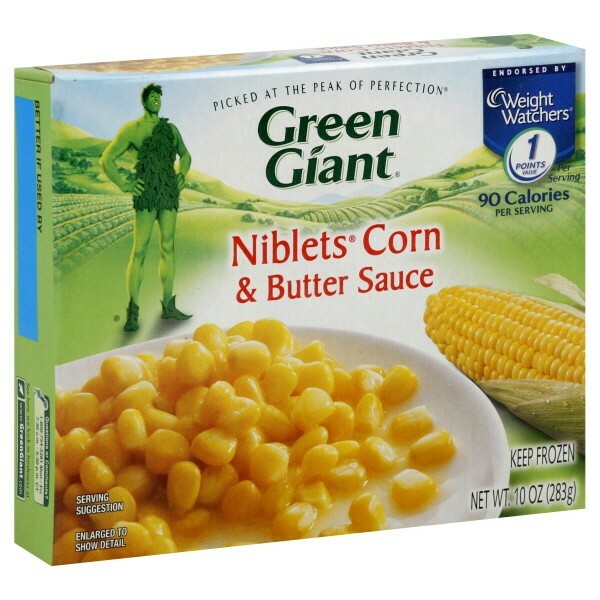 Either buy some Green Giant microwavable pouches of niblets in butter sauce (super easy choice), or make the never fail corn casserole that uses a Jiffy cornbread mix. May I suggest a lettuce salad? It’s easy, colorful for your table, and honestly most Thanksgiving menus could do with a few lighter dishes.